There were bruising battles between the Yes and No sides in the final week of the Lisbon Treaty referendum campaign. The debate was entering its final 24 hours as An Phoblacht went to press and while last weekend’s polls had the Yes side ahead, the volume of people making their minds up at the last minute and the widespread anger at the Government indicates a close contest with No campaigners believing they can secure a second rejection of the Treaty. “The Lisbon Treaty is Fianna Fáil’s Treaty. The Lisbon Treaty contains the same failed right-wing policies that brought the economy into recession. “The key question for voters is if Fianna Fáil have got is so wrong on NAMA and on Born Snip Nua how can anyone trust them on Lisbon? “As the party who have presided over the loss of 200,000 jobs in 12 months how can Fianna Fáil’s claims that supporting Lisbon will bring jobs and economic recovery be taken seriously? 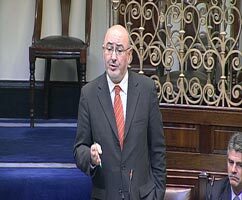 Sinn Féin Dáil leader Caoimhghín Ó Caoláin TD described as “outlandish and insulting” the attempts by Pat Cox to compare the Good Friday Agreement and the Lisbon Treaty and to castigate Sinn Féin for not supporting the latter. Noting that Cox made his remarks in the Border County of Monaghan and that he had no role in the Peace Process, Deputy Ó Caoláin said Cox “deserves the Brass Neck of Europe Award”. “Pat Cox attempts a ludicrous comparison between the Good Friday Agreement and the Lisbon Treaty, stating that the so-called guarantees obtained by the Irish government have been lodged with the UN in the same way as the Good Friday Agreement. “We are not voting on the so-called guarantees, we are voting on the actual content of the Lisbon Treaty, not one comma of which has been changed, as Pat Cox well knows. “Pat Cox played no role in the negotiation of the Good Friday Agreement. I did. I was also deeply involved in the debates within Sinn Féin afterwards and I know that the Agreement was proposed and supported on the basis of what it contained and the potential it had to make peaceful political progress possible. It was and is dependent on the political will of both Governments and all parties to implement it. The lodging of the Agreement with the UN had little to do with how it was ‘sold’. “The issue is not the manner in which the so-called guarantees on Lisbon will come into effect by being lodged with the UN. 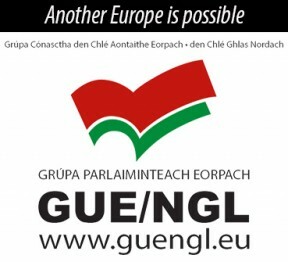 The issue is that they do not alter the content of the Lisbon Treaty. “Just as a better deal was possible in the Peace Process, a better deal is possible in Europe. A deal based on democracy, equality and prosperity. A deal that replaces the outdated and discredited Lisbon Treaty with a new deal for the new and challenging times in which we find ourselves. Reacting to the call from American Chamber of Commerce for a Yes vote Sinn Féin vice-president Mary Lou McDonald it was no surprise as Lisbon will lead to greater liberalisation of public services, international trade and energy provision and downward pressure on wages. Saying No to Lisbon in 2008 had no impact whatsoever on jobs. The same will be true if we rejected the Treaty on 2 October.